The Islamic civilisation series takes a look at prominent Muslim empires that have existed throughout history. In this article we present a brief overview of the rise and fall of the Mamluk Sultanate in Egypt. The Mamluk Sultanate of Cairo is a standout epoch in Islamic history and is perhaps the grandest example of a rags-to-riches story. The Mamluks left behind a fascinating legacy, fraught with controversy, political assassination and factional conflict - the perfect plot for the next blockbuster TV series. The Mamluks of Egypt would rise from mere servants to commanders of a vast empire which would eventually encompass Egypt, Hijaz and the Levant. The word Mamluk (singular) or Mamalik in the Arabic language means something that is owned and can be used more generally to refer to slaves who were used for military purposes by various Islamic empires throughout history including in the Abbasid period and also emerging in India. 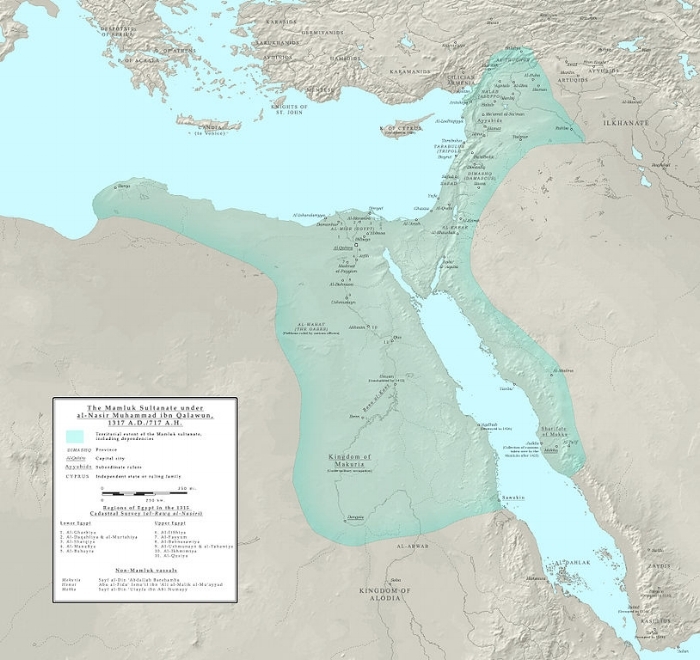 The Mamluk Sultanate of Egypt lasted in an intermittent form between 1250 and 1517. The Mamluks were mostly made up of ethnic Turks who had ancestral ties with the Turkic Kipchaks, they were originally acquired as slaves but were given a higher status within the empires they served, being provided extensive military training and education in the Islamic sciences. Their emergence begins within the 10th century under the famed Ayyubid dynasty founded by Salahuddin Al Ayubi. Under the Ayyubids the Mamluks were given extensive military positions and were an integral part of the military structure. After the final substantive Sultan As-Salih Ayyub passed away following his successful campaign against the 7th crusade, a convoluted series of events resulted in the Mamluks effectively inheriting the seat of power. The first of the Mamluk Sultans was Izz al-Din Aybak who also happened to marry Shajar al-Durr the widow of the final Ayyubid Sultan As-Salih Ayyub. Aybak inherited power as a result of Shajar's abdication as the Sultana (Female Sultan) of Egypt. In a bizarre turn of events, Aybak was murdered by Shajar after his decision to strategically marry the daughter of the Emir of Mosul. Aybak's reign lasted a mere 7 years and his adolescent son inherited power being put in place by an assembly of loyalist Mamluks known as the Mu'iziyya Mamluks who were principally led by the renowned Saif ad-Din Qutuz. Following in the tradition of his father Aybak's son ruled for a meagre two years and thereafter Saif ad-Din Qutuz ascended to power. Qutuz is perhaps the most illustrious Sultan of the entire Mamluk period despite ruling for an even shorter period than his predecessors. Qutuz was a Kipchak originally enslaved by the Mongols and later sold to Aybak the Ayyubid Sultan. As the leader of the Mamluks, Qutuz led the first ever army to defeat the Mongols on the battlefield an achievement that has cemented his vestige in Islamic history centuries on. His reign was followed by that of Baibars who reigned for 54 years, under Baibars the Mamluks firmly established their government and made significant territorial gains wiping out Crusaders in the Levant and unifying Egypt and Syria. The Battle of Ain Jalut was a defining moment in the formation of the Mamluk state and is also the reason behind Qutuz and Baibars renown in relation to other Mamluks Sultans. The Battle of Ain Jalut was initiated after the sacking of Baghdad and the continued advance of the Mongol army. At the time Baghdad was considered the ‘capital’ of the Islamic world and numerous tales tell of the devastating attack when the Tigris river ran red with blood and the ink of books turned the water black. The attack on the Islamic capital of Baghdad which also contained the House of Wisdom library (Bayt al-Hikma) sent shockwaves throughout the empire, and this sentiment was further exacerbated by a letter sent by the Mongol leader Hulagu to the Mamluk leadership. Qutuz’s response to the letter was damning and he responded by killing the two envoys who had delivered the message, placing their decapitated heads on spikes outside the entrance of the city of Cairo. The Mongols swept through the Muslim lands taking Baghdad as well as cities in Syria such as Damascus and Aleppo. With the Mongol advance threatening the centre of the Mamluk Sultanate in Egypt the Mamluks were pressed to make a decision and Qutuz eventually led an army through the Levant region to meet the Mongols on the battlefield. Both Qutuz and Baibars participated in the battle and through skilful military tactics which included a carefully orchestrated attack and retreat manoeuvre the Muslims were able to conclusively defeat the Mongols and halt the western advance. A landmark achievement at the time as the Mongols had never previously lost in combat. Qutuz had successfully done what many other commanders before him had failed to do but unfortunately for him, his attainment was not enough to spare him his life. While returning to Cairo he was assassinated by the very men he had led in battle. There are debates around who exactly was responsible for his death however evidence seems to suggest Baibars was involved in Qutuz’s demise. Baibars then went on to reign for 54 years, it was under his rule that the Mamluks firmly established their government and made significant territorial gains wiping out Crusaders in the Levant and unifying Egypt and Syria. The Mamluk Sultanate is described as an 'intermittent empire' due to it having two unique periods of existence. The Sultanate can be characterised under two forms, the early Bahri period (1250 - 1382) and the Burji dynasty (1382 – 1517). Generally, the Bahri period is seen to be the more stable and successful period whereas the Burji dynasty was fraught with controversy and infighting. In regards to the long-term contributions of the Mamluk sultanate one area which can not be dismissed was the cultivation of religious scholarship. The Sultanate generally adhered to the Shafite school of thought. However, under the rule of Baibars, multiple schools of thought were facilitated for, creating a hub of Islamic scholarship. The emergence of the Mamluk Sultanate created a breadth of scholarship of which the Muslim world is indebted to till this day. This era saw the works of figures such Imam Nawawi, Jalaluddin Suyuti, Ismail Ibn Kathir, Taj al-Din Subki, Al Dhahabi, Ibn Taymiyyah, Ibn Hajar and Ibn Al Qayyim to name but a few. The Sultan Hassan Mosque in Cairo, construction began in 757 AH and it is still operational to this day. The relationship between religious clergy and government was not always a smooth one. Although Ibn Taymiyyah is perhaps one of the most renowned scholars of this time his views were not representative of the Sultanates conventional ideas and he often found himself in conflict with the judicial system. The Mamluks did not consider themselves Caliphs of the Muslim Ummah rather they held in great esteem the Khalifa of the former Abbasid empire. Although the Abbasids had fallen into decline and the Mamluk sultans had acquired total political control, as a general policy they never took up the position of Khalifas of the Muslim world. Instead, the members of the Abbasid family held the symbolic title of Khalifa and were used to legitimise the Sultans control over the Muslims. Towards the end of the Burji dynasty, a series of events including poor military decisions and infighting resulted in the weakening of the Mamluk state and a new Muslim dynasty was rising in the North. The Ottoman Turks after a successful campaign against the Safavids made their way through Syria and after successfully defeating the Mamluks at the Battle of Marj Dabiq they were able to annexe Syria, paving the way for a final attack on the Mamluk heartland of Cairo. The Mamluks finally lost control of Egypt in 1517 at the hands of Ottoman Sultan Selim I. Similar to the Mamluk-Ayyubid relationship after their ascension to power the Ottomans kept the Mamluks in control of Egypt but as subordinates to the ultimate power in Constantinople. Looking back at this point in Islamic history the Mamluks contribution to Islam was incredibly important. If the battle of Ain Jalut was lost the Mongol advance would have been orchestrated with relative ease, crushing the Mamluk capital in Cairo and making its way to North Africa. If it weren’t for the efforts of the Mamluks against Mongol and Crusader armies, Islam in Africa and the Levant may have been under severe threat. The lessons one can take from the Mamluks is one of perseverance and dedication, the Mamluks fought as loyal servants and were able to rise to the honoured position of leaders of an empire that saved the Islamic world. This article was inspired by the wonderful brothers over at the Mad Mamluks podcast. If you're looking for an informative but also entertaining Islamically oriented podcast show, I would definitely recommend checking these guys out.